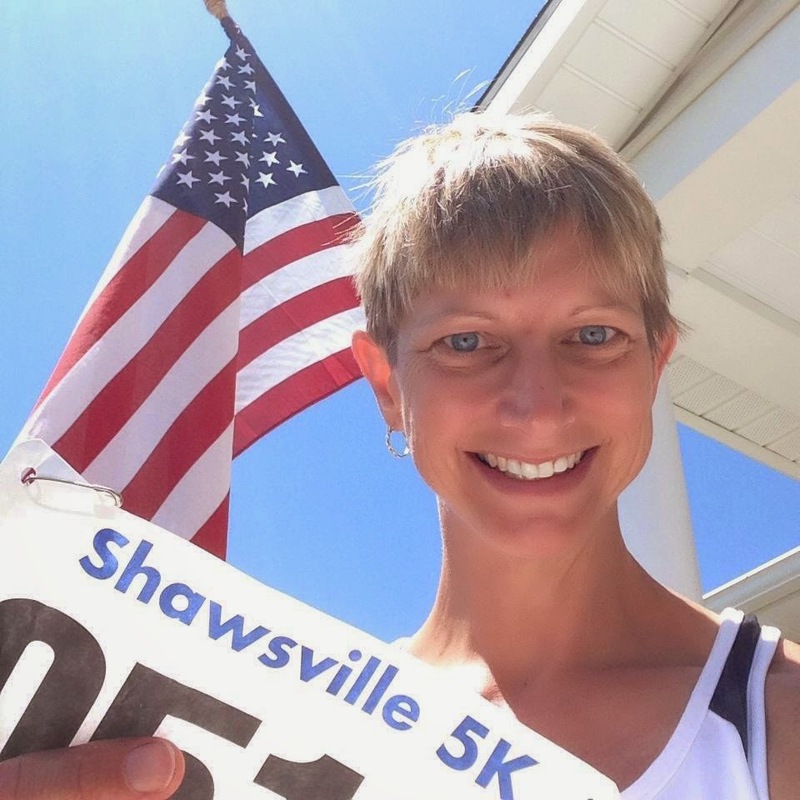 On the Fourth of July I ran the Shawsville 5K. It's held along a bike route I ride often, but this 33rd annual was the first time I had participated. I always felt like I was too busy or too focused training for some triathlon, that I never really considered running it. What a shame! It'll be on my calendar from now on for sure as a great chance to run a hometown race with so many friends!! A fast group of 210 runners turned out for this fairly flat and fast course. 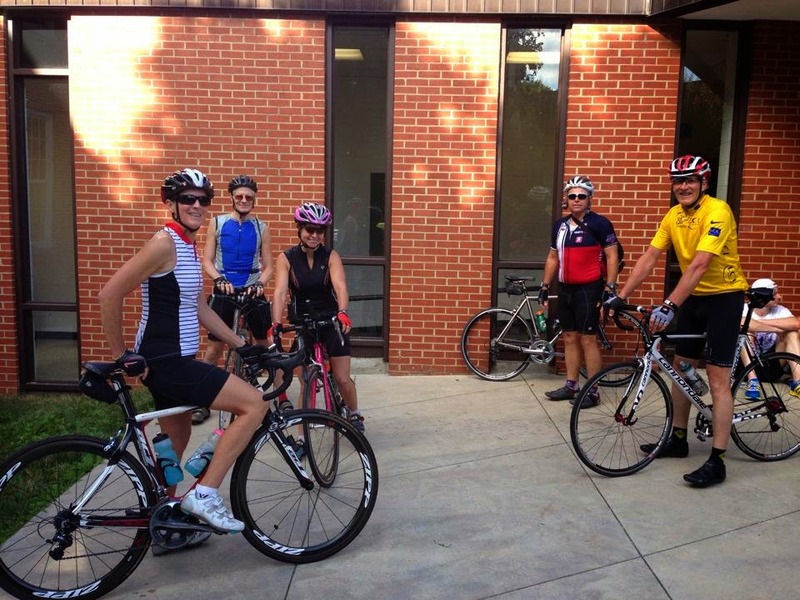 Some Roanoke triathletes and cyclists, Betsy, Donna, John, Mike, and John, rode the 25ish miles to the race, ran, and rode back! I have to admit, cycling to the race crossed my mind (about 18 miles for me), but on this day I was interested in seeing what I could do on fresh legs. It was not smooth sailing into the race for me. I didn't blog about it, but two weeks prior I dropped my chain on my bike and it got stuck. I came to a sudden stop and unable to unclip in time, I hit the asphalt hard enough to leave bruises (Thank you Richard and Sandy for the transport home). I thought I was OK but during a run the following day, I felt a sharp pull in the quad of my "good" leg that ended my workout prematurely. I had spot tenderness and took the following day off to ice and rest. I was a bit worried and it took a good week or so to resolve. Thankfully it did but it was a little tentative up until the race. Race day I felt pretty good and stayed relatively relaxed from being around so many people I knew. We all lined up to start. Coach Jim suggested a 7:05-7:10 first mile then trying to do a slight negative split. It ended up being a 6:58 first mile. It's amazing how easy the first one always feels when you take off with the crowd! I was surprised to pass my friend Alice, also a master's runner and former collegiate cross country runner, but she was only getting warmed up. Toward the end of the first mile she blew past me! Soon after, I came up on Aileen, one of the 13-year-olds who smoked me in the final mile of the Downtown Sundown 5K and figured I'd try to hang with her as long as I could. I found out later she had some cramping which kept her from dusting me THIS time! I followed my first mile with 6:56 and 6:59 splits the next two miles for a total 5k time of 21:29 (6:54 pace) to give me the 45-49 age group win. (Alice was the fastest over 40 with me second to her about 20ish seconds back. Results are not up yet.) Mentally, this race felt far more relaxed than the last one so that was even more significant than the time improvement. Though we all start together, the race finishes with two chutes - one for the men, one for the women. 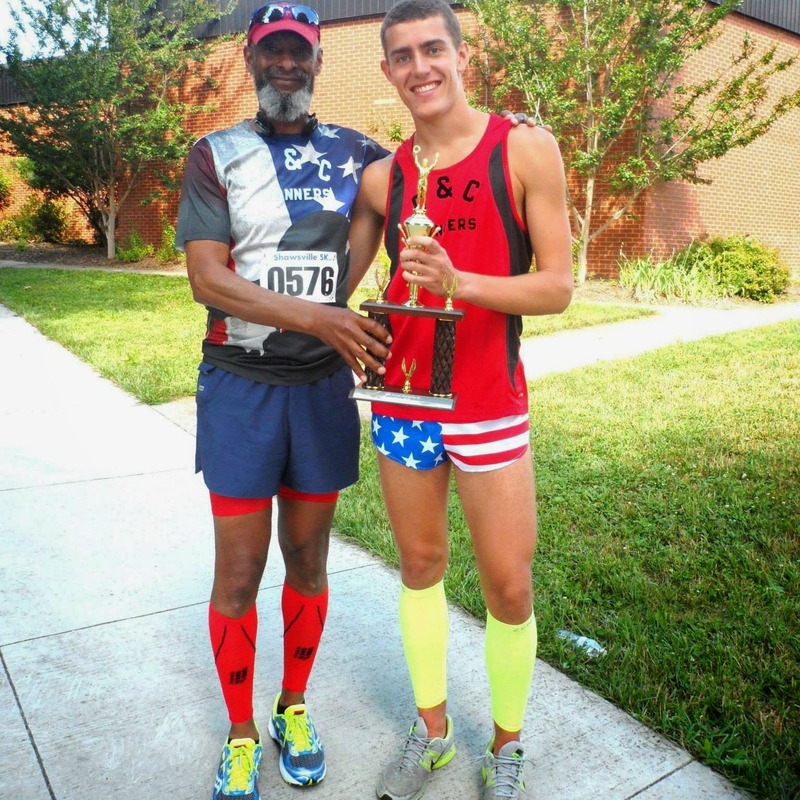 In the picture below, One-on-One Endurance athlete Justin Hendrix and I finished nearly together! 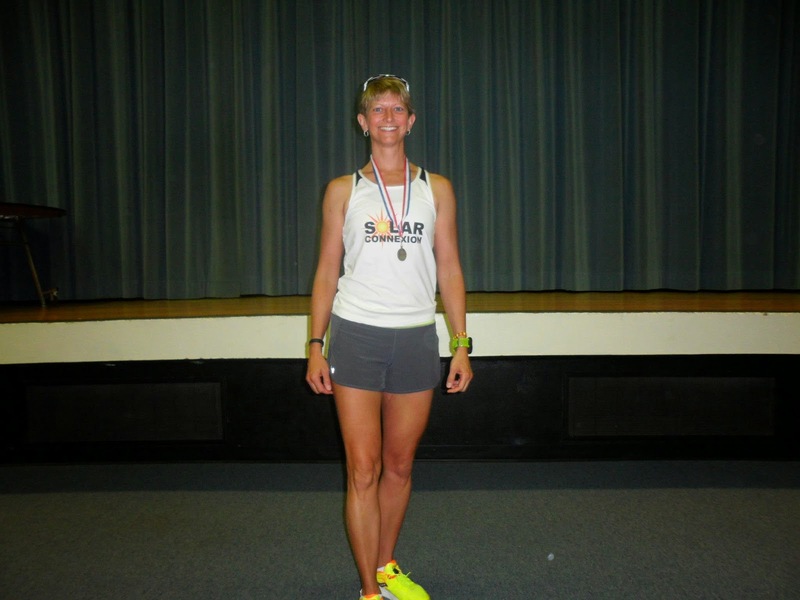 Thanks Marion Childress of C and C Runners for the photos! A nice silver lining of my race year being disrupted by surgery is that it got me out of my prior race schedule habits. 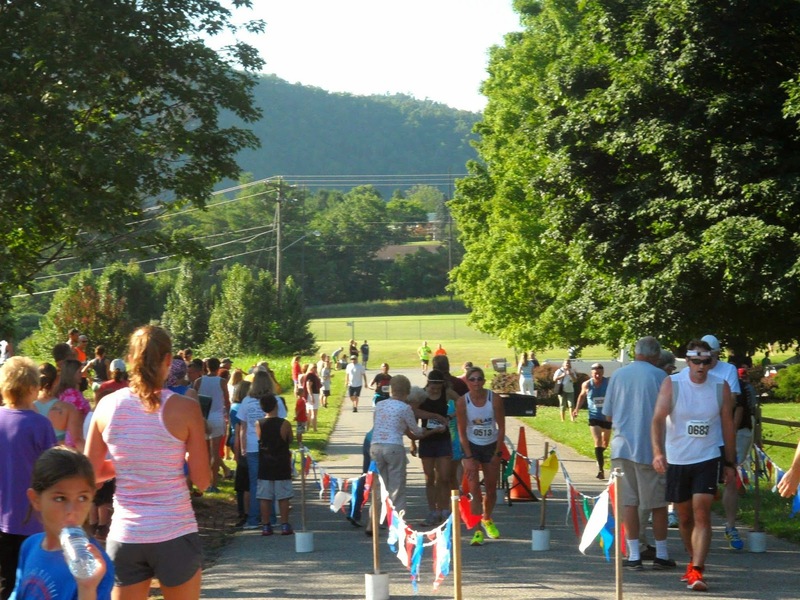 That had included racing at least five Virginia Triathlon Series races each year to be eligible for awards. Once I let VTS go, it gave me more flexibility. Now that I know I can run 5Ks, it's time to see what I can do with a sprint and Olympic triathlon. Up this weekend, Colonial Beach! !